Can You Eat Canned Tuna While Pregnant? Fish are a good source of protein and other nutrients and an excellent source of omega-3 fatty acids. They are low in saturated fat, promote heart health and are part of a well-balanced diet. However, as a pregnant woman, you must reduce your exposure to chemicals that can harm your growing baby. Because tuna and other fish contain varying levels of mercury, the U.S. Environmental Protection Agency offers specific recommendations for expectant mothers. The EPA recommends you limit your fish consumption to 12 ounces per week, which equates to two average meals containing 6 ounces each. Canned light tuna is low in mercury and is one of the best options if you are pregnant. Albacore is a white variety of tuna and comes from a bigger fish than light tuna. The larger the fish, the higher the mercury levels. 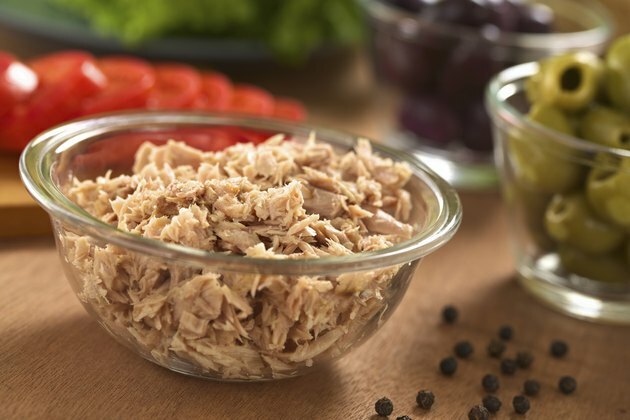 The EPA confirms that albacore contains higher mercury levels than canned light tuna. If you choose albacore canned tuna, limit your consumption to 6 ounces weekly. Following these guidelines will help reduce your exposure to mercury. Is There Limit to How Much Tuna Fish and Sardines You Can Eat?